Thought that the revelations of NSA/GCHQ spying were dying out? Having some "surveillance fatigue" from all the stories that have been coming out? Have no fear -- or, rather, be very very very fearful -- because two big new revelations this week show just how far the NSA will go to make sure it collects everything. First up: your hard drives. Earlier this week, Kaspersky Lab revealed that the NSA (likely) has figured out ways to hide its own spyware deep in pretty much any hard drive made by the most popular hard drive manufacturers: Western Digital, Seagate and Toshiba. Kaspersky said it found personal computers in 30 countries infected with one or more of the spying programs, with the most infections seen in Iran, followed by Russia, Pakistan, Afghanistan, China, Mali, Syria, Yemen and Algeria. The targets included government and military institutions, telecommunication companies, banks, energy companies, nuclear researchers, media, and Islamic activists, Kaspersky said. The firm declined to publicly name the country behind the spying campaign, but said it was closely linked to Stuxnet, the NSA-led cyberweapon that was used to attack Iran's uranium enrichment facility. The NSA is the U.S. agency responsible for gathering electronic intelligence. A former NSA employee told Reuters that Kaspersky's analysis was correct, and that people still in the spy agency valued these espionage programs as highly as Stuxnet. Another former intelligence operative confirmed that the NSA had developed the prized technique of concealing spyware in hard drives, but said he did not know which spy efforts relied on it. As the report notes, it appears that this is a kind of "sleeper" software, that is buried inside tons of hard drives, but only "turned on" when necessary. The report notes that it's unclear as to how the NSA was getting this software in there, but that it couldn't do it without knowing the source code of the hard drive firmware -- information that is not easily accessible. A few of the hard drive manufacturers have denied working with the government on this and/or giving them access to the firmware. It's possible they're lying/misleading -- but it's also possible that the NSA figured out other ways to get that information. The company targeted by the intelligence agencies, Gemalto, is a multinational firm incorporated in the Netherlands that makes the chips used in mobile phones and next-generation credit cards. Among its clients are AT&T, T-Mobile, Verizon, Sprint and some 450 wireless network providers around the world. The company operates in 85 countries and has more than 40 manufacturing facilities. One of its three global headquarters is in Austin, Texas and it has a large factory in Pennsylvania. 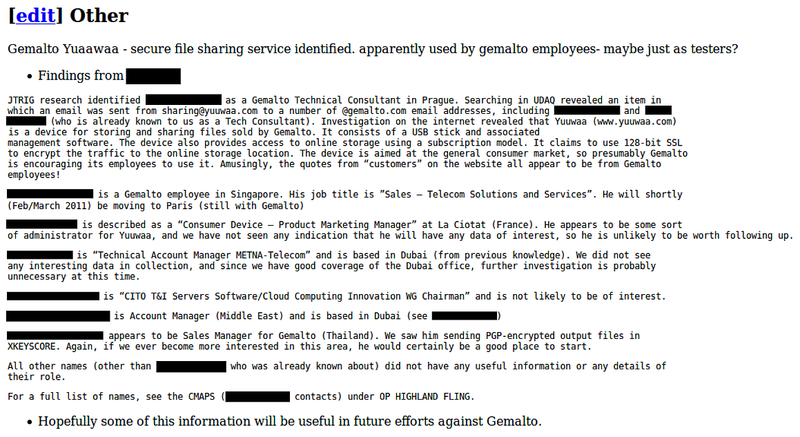 The details of just how the NSA hacked into Gemalto are quite a story -- and proves what a load of crap it is when the NSA and its defenders insist that they only target bad people. As former NSA (and CIA) boss Michael Hayden recently admitted, they actually like to spy on "interesting people." And who could be more interesting than the people who have access to the encryption keys on billions of mobile phones? So, yeah, the NSA and GCHQ basically spied on IT folks at the company until they found a way in. So, the NSA spies on "bad guys" and "IT people" for the good guys. Because, I'm sure they'll claim, it helps them get the bad guys. We've seen this before, when the GCHQ hacked into Belgian telco giant Belgacom, allowing them to tap into communications at the EU Parliament. Hacking into various companies appears to be standard operating procedures for the NSA/GCHQ these days, with no thought to the collateral damage being caused. Between both of these big stories this week, it's clear that the NSA is basically deeply buried in pretty much every bit of electronic equipment these days, with the tools ready to go to spy on just about anything. The idea that this power isn't being abused regularly is pretty laughable. Or a related question, since they pretty much have unrestricted access to everything, why is there still terrorism in the world? It's getting harder as phone booths keep disappearing, though.